With 3.5 million units sold in just 48 hours, The Elder Scrolls V: Skyrim is officially Bethesda's biggest game ever. The question was never whether or not Skyrim would be a hit, but just how big a hit it would be. The answer, it turns out, is pretty damn big: Bethesda announced today that of the seven million units shipped worldwide for the Xbox 360, PlayStation 3 and PC, more than half sold within 48 hours. 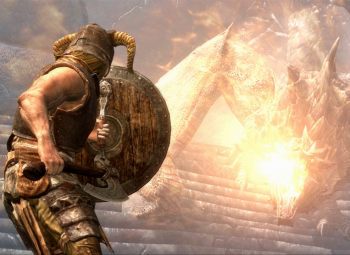 "We are grateful for the fans' response to Skyrim," said ZeniMax Media Chairman and CEO Robert Altman. "Todd Howard and his team at Bethesda Game Studios have crafted a very special game. Anticipation for Skyrim has surpassed any game in our company's history." "Without a doubt, this has been our most ambitious project ever," added Howard, the game director on Skyrim. "After over three years of development, we're finally excited to get it into everyone's hands." It's not quite in the league of Modern Warfare 3, which sold twice as many copies in half the time, but it's a hell of an accomplishment nonetheless and especially so for a single-player-only RPG. Skyrim also made a big splash on Steam, where it set a new record with more than 280,000 concurrent players, and it's doing pretty well with critics, too, notching up an aggregate score of 95 on Metacritic.